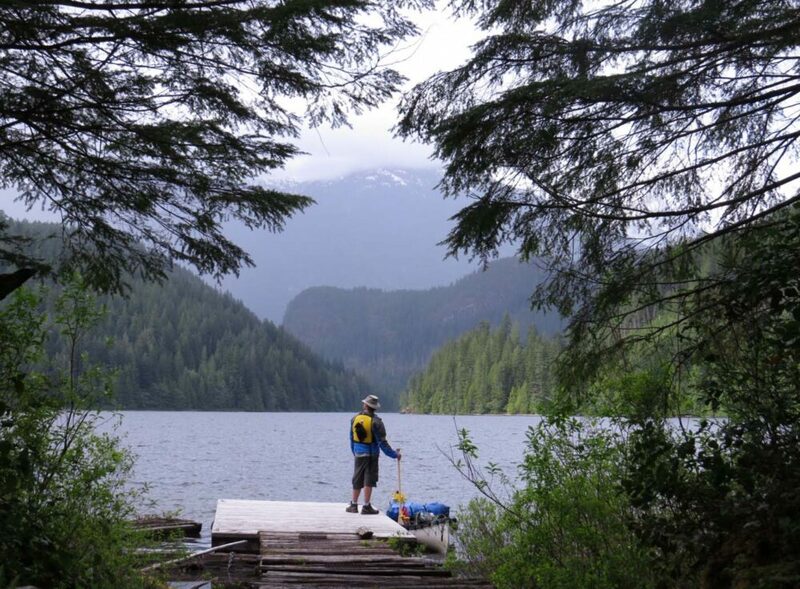 Despite being remarkedly close to civilisation, the Powell Forest Canoe Circuit offers a surprisingly remote and peaceful BC wilderness experience. The scenery is ever changing but resoundingly lush and full of life, even in the rain. 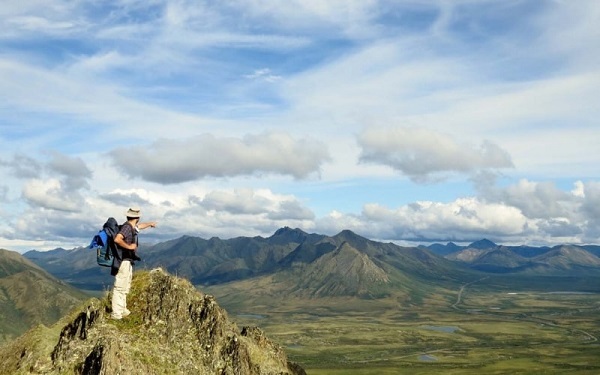 Think white-capped mountains, deep blue fjords and misty temperate rainforests. 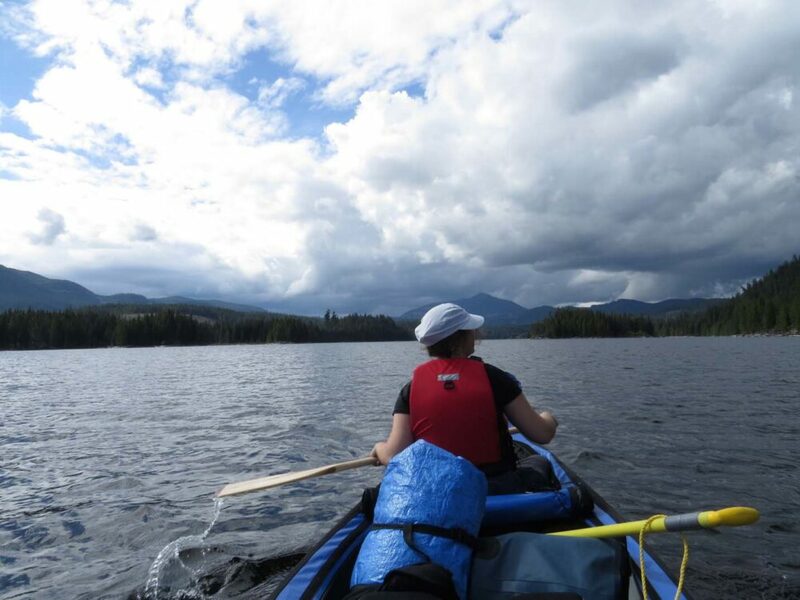 Including eight lakes and around 55km of paddling, the Powell Forest Canoe Route is an exciting beyond the beaten path multi-day paddling adventure on the Sunshine Coast. 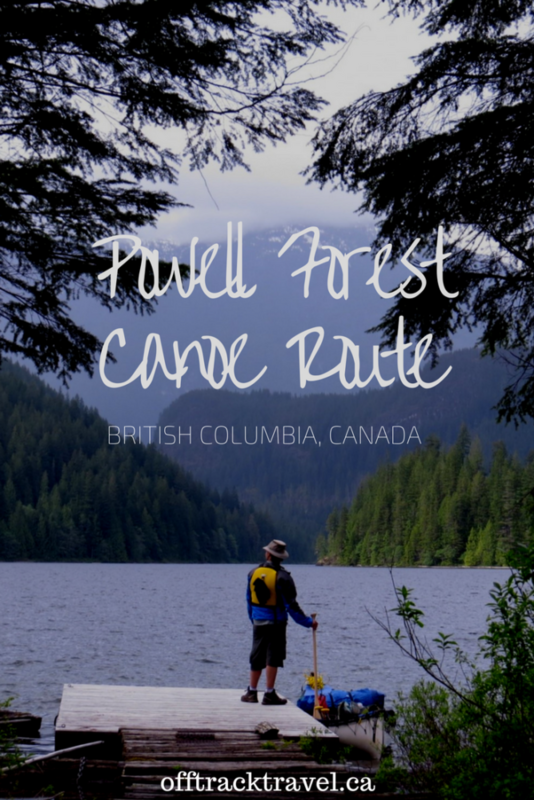 The Powell Forest Canoe Circuit was our first experience of outdoor adventure on BC’s mainland, and it set the theme for the rest of our five-month road trip. Almost everything is bigger on the mainland (I say ‘almost’ due to Vancouver Island having some pretty huge trees). While this circuit wasn’t that much larger than the first one we did on Vancouver Island last year, over half of the paddling is on just one lake. And that 30km of paddling isn’t the full length of the lake. Powell Lake is actually over double that in size. Like I said things are bigger on the mainland. We started the Powell Forest Canoe Route on an ominously cloudy and drizzly day. 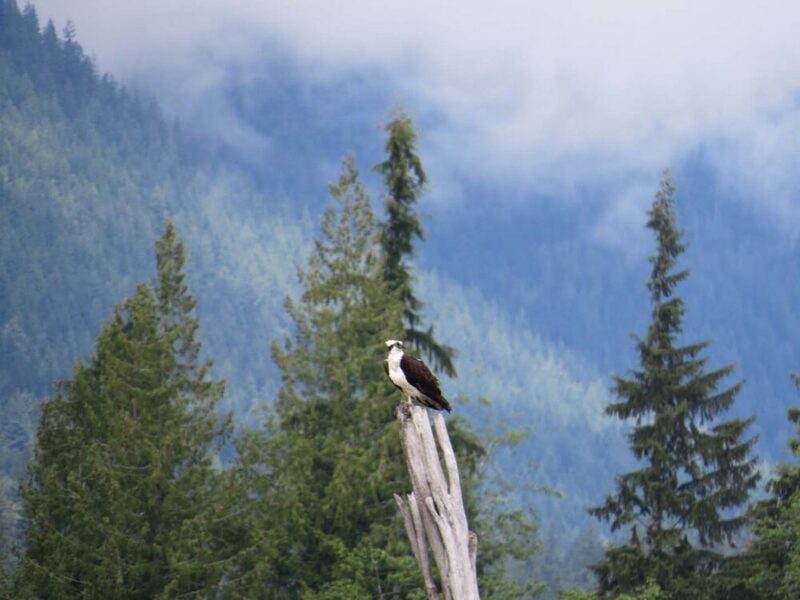 The sun peeked through the clouds here and there, but for the most part, it was just us, the relatively calm waters of Lois Lake and a few ospreys flying above. Not a single other boat was on the lake. It felt like we had the entire Powell Forest to ourselves. Canoe circuits are immensely satisfying. 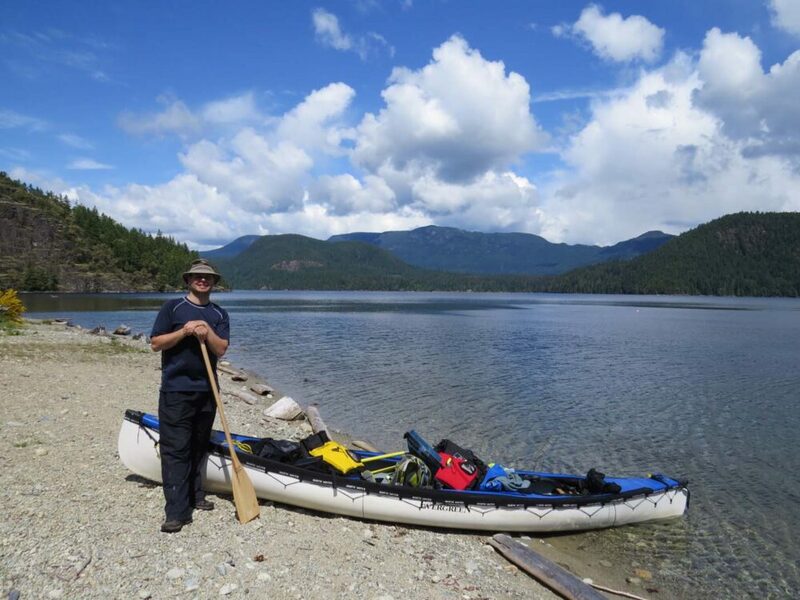 It is a fantastic challenge to transport your gear over both land and water, and the mixture of hiking and paddling keeps the experience and scenery varied. One of the most difficult aspects is undoubtedly the portages, the actual act of manoeuvring yourself, the canoe and gear between lakes and other waterways. 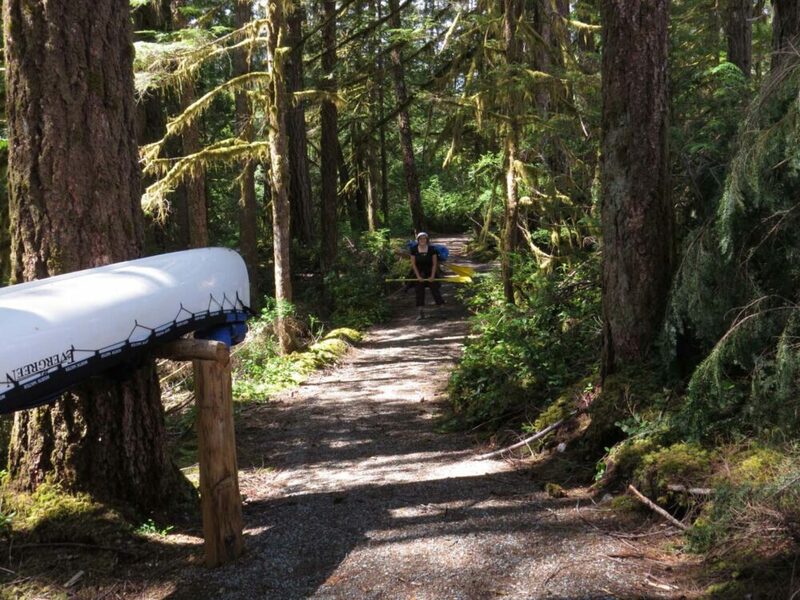 The portages on the Powell Forest canoe route are more numerous and longer than the Sayward Circuit. Luckily (or unlucky for some? ), it is not really possible to use canoe carts on the portages on the Powell Forest route. For this reason, there is frequent canoe rests every 200m or so. This made for a very happy Jean Robert, who prefers to carry the canoe overhead in the traditional style. With the canoe rests, portaging was made much easier. Aside from the portages, we were also impressed by the campsites and general upkeep of the route, especially since it was still early season. The signage was great and most campsites were in good condition (free firewood! ), though at some it was hard to find a place flat enough to put the tent up on. The floating docks at the majority of the put-in and takeout spots were awesome. Using these, we managed to avoid the worst of the mud. One of the unique features of the Powell Forest canoe circuit is the choice of routes at the end of Horseshoe Lake. The western route has fewer but longer portages while the eastern has more portages over less distance. We chose to go east, which I believe is the lesser used side. When attempting to reach our first portage on this side (to Little Horseshoe Lake), we found a major logjam blocking our landing. To get through, we had to play a bit of log Tetris. 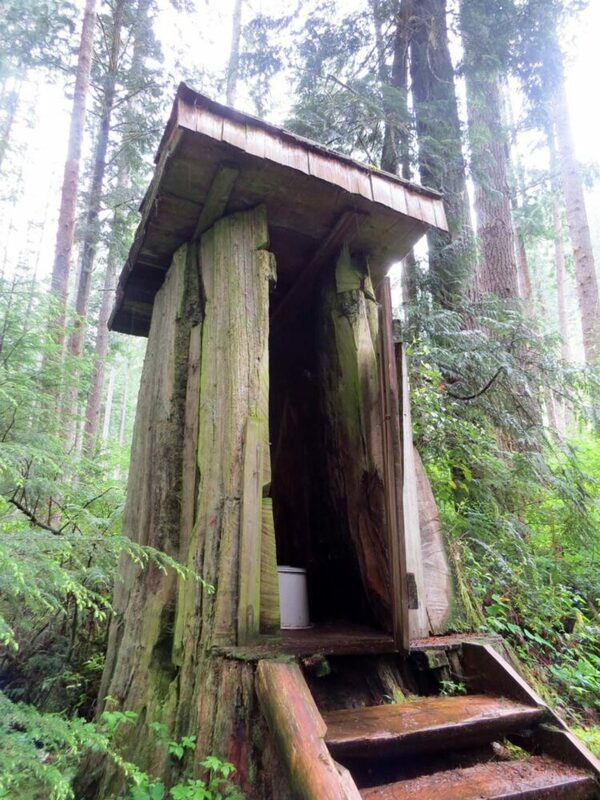 Good thing water makes logs weightless and all. Remember when I said that it felt like we had the circuit all to ourselves? As it turns out, we actually did. Over the whole five days we were on the circuit, we saw no other paddlers or campers. The most human activity we saw was two people and their dog hanging out at their cottage on Dodd Lake. Despite seeing hardly anyone, the Powell Forest canoe route is not quite wilderness. 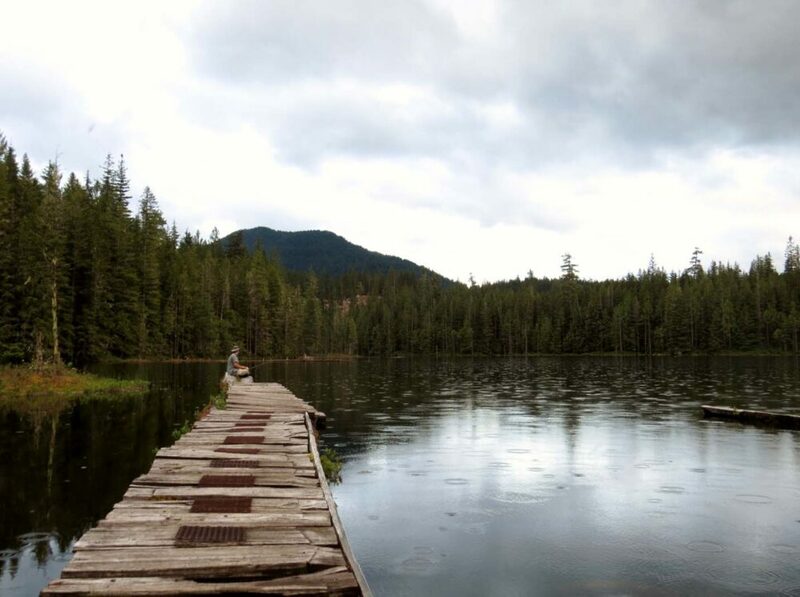 There are logging roads around most of the lakes and a fair amount of houseboats and cottages, especially on Powell Lake. Windsor Lake was by far our favourite lake with beautiful views of the mountains, waterfalls cascading hundreds of feet, no clear-cuts and a mostly quiet logging road. It was a good place to be rained in on day three when it absolutely poured down for 12 hours straight. Not to worry, we weren’t exactly in a rush to start the next portage to Goat Lake, a 2.4km route descending 100m elevation. With a canoe on your head, that’s not particularly fun. At least, that’s what JR told me anyway. 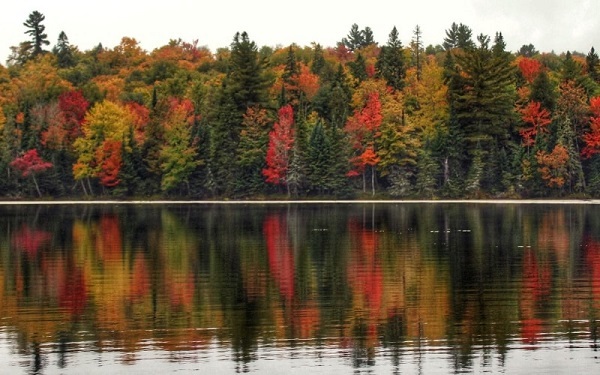 Wilderness or not, there is plenty of beauty to be found in the Powell Forest. The mountains peeked out of the clouds when they could, bald eagles circled above us, huge frogs hopped along on the portage paths, and giant tadpoles swam under the floating docks. 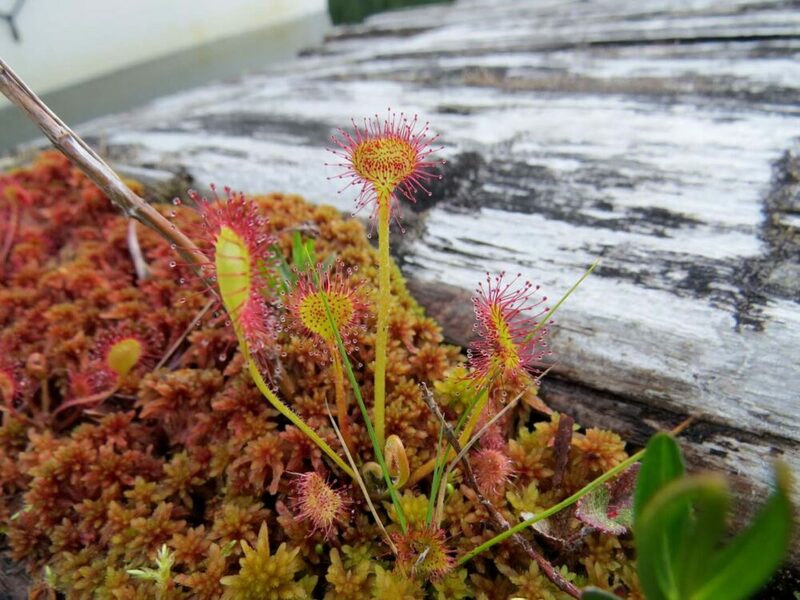 Everywhere you look is lush temperate rainforest, practically dripping with life. Most of the lakes in the Powell Forest are small, easily crossable in a few hours or less. 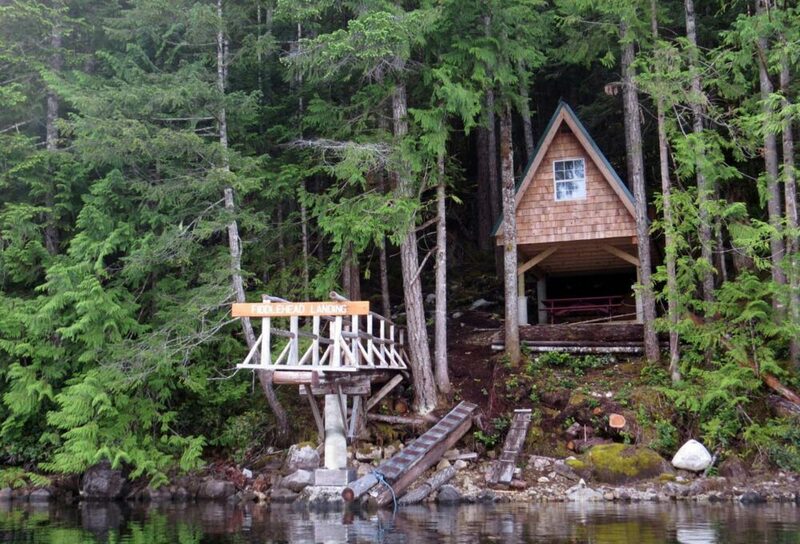 Powell Lake is different. Deep, mysterious and seemingly never-ending, paddling it is an experience in itself. We started our last day early, with almost 20km left to paddle on this great lake. Halfway through, one-metre swells and headwinds started and accompanied us all the way to the end. Even so, we admired the immense power and size of this lake. We spent our last night on the circuit in the Fiddlehead Landing hut on Powell Lake, one of many on the 180km Sunshine Coast Trail. It was wonderful to be out of the tent after two days in the rain, though the hut’s ventilation grates didn’t keep out the vicious blackflies. Bug bites aside; staying in the Fiddlehead Landing hut was a great way to end our time on the Powell Lakes route. 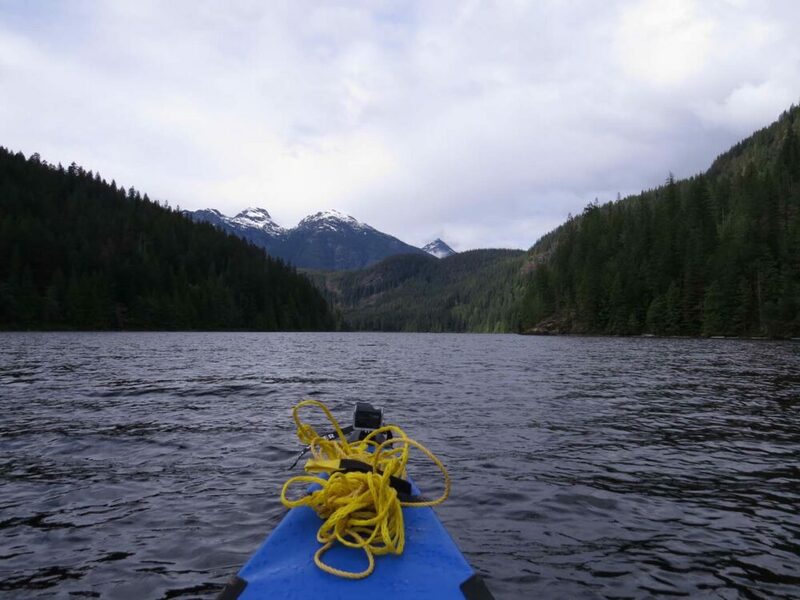 Despite the challenging weather, it was still a fantastic trip, a great in-between from our first circuit on Vancouver Island to our third, Bowron Lakes (100km paddling). 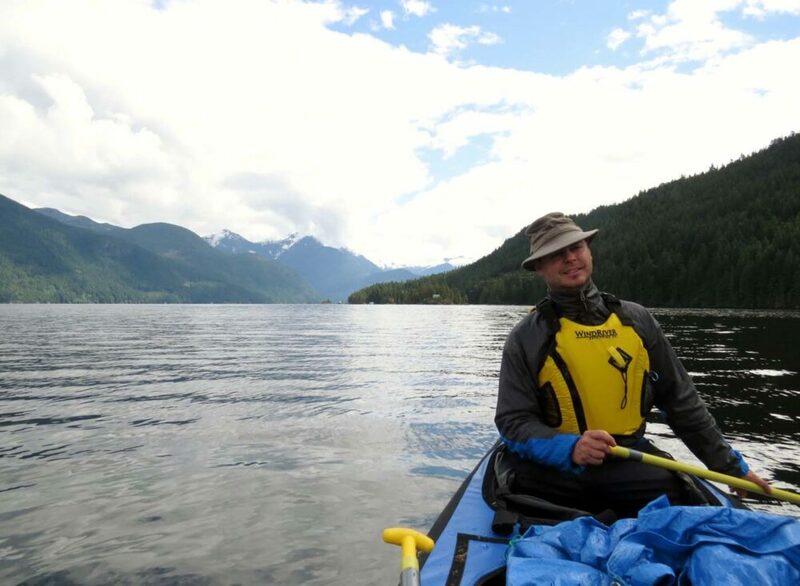 The standard Powell Forest Canoe Circuit, located on BC’s Sunshine Coast, includes eight lakes, with around 55km of paddling and 8km of portage. There are quite a few adaptions to the route; you can add more lakes (such as Khartoum near the start or Inland close to the end), or cut it down to about half by turning around at Dodd Lake. Choosing the ‘less travelled’ route of Horseshoe-Little Horseshoe-Beaver Lakes to lessen our portage kilometres (to just over 7km), we ended up doing one more portage overall. We spent five days on the circuit, including one ‘rained in’ day at Windsor Lake. This is a nice amount of time to allow for one ‘lazy’ day in the summer, swimming in the lakes or fishing. 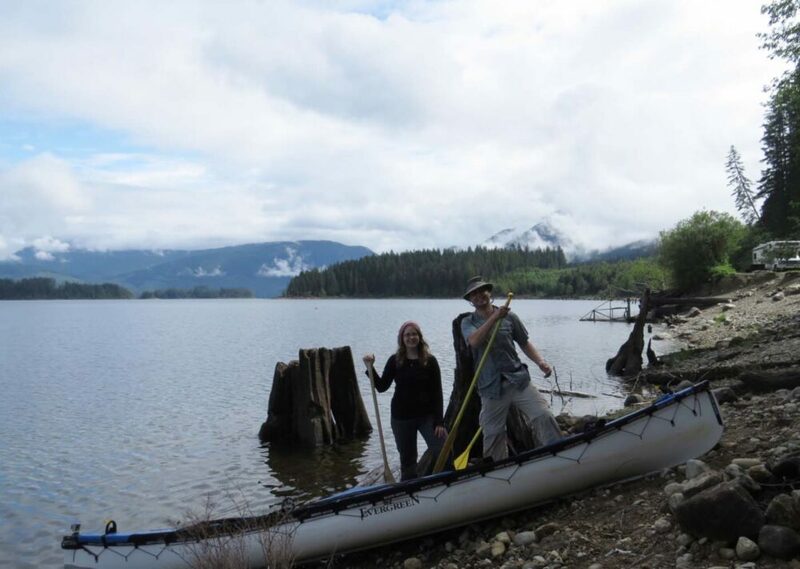 We paddled the Powell Forest canoe route in early May. 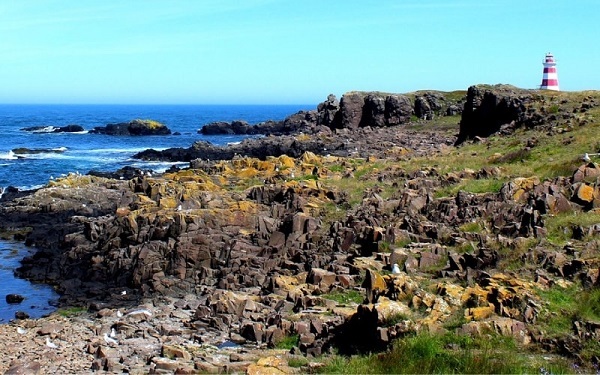 The best time of year for favourable weather would be June to September. Water levels will be lower in late summer. If we paddled the route again, we’d probably aim for June or September to avoid the busiest time on the lakes. One downside to this trip is that it is unfortunately not a true canoe circuit where you finish exactly where you started. 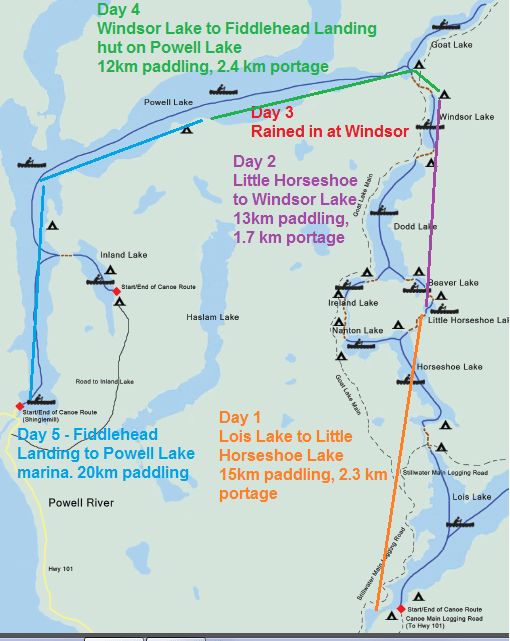 There is an approximate 30km gap between the end at Powell Lake and the start at Lois Lake. If you’re in a group with at least two cars, this is not much of a problem since there is a fair amount of parking both at Lois Lake and Powell Lake’s marina (the latter with a charge). If you only have one car, it’s more difficult. 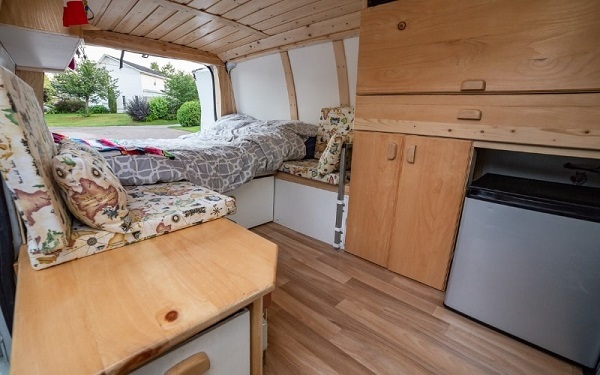 The easiest way is to arrange a shuttle with a local company to take you and all your gear (including canoe) back to Lois Lake from the marina. The quote was $150 for this. Since we have more time than money ($150 = two weeks budget), we figured out an alternative. 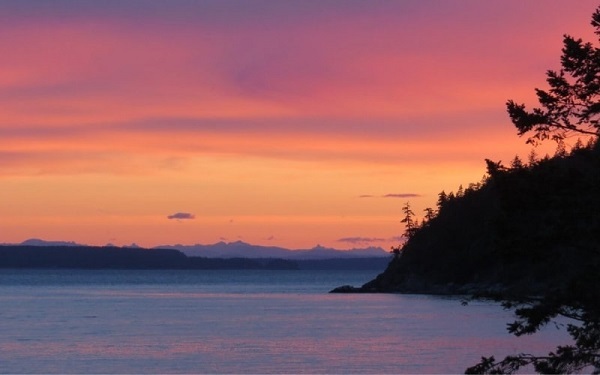 There is a local bus service that travels along the coast road regularly, passing by the marina on its way to Powell River mall. Leaving from the mall, there is then a rural bus service that stops near the logging road turnoff to Lois Lake. From here, you would have to hike 6km to get back to your vehicle, and finally drive back to Powell Lake to pick up the canoe and the other person. This was our original plan as it would cost less than $5 (well, minus gas). Unfortunately, the last rural bus service of the day leaves the mall at around 2pm and we finished the circuit at 2.30pm. So we had to do Plan B – JR rode the bus to the mall and then took a taxi to the logging road turn off. 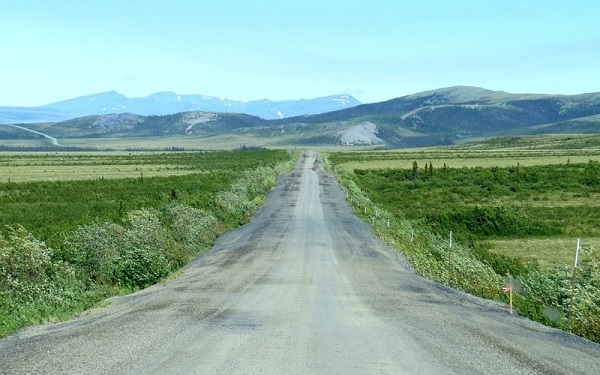 As it was, the taxi driver didn’t mind driving on the logging roads, so JR was able to get to the van and then back to the marina a lot quicker. It cost $50 for the taxi, $2 for the bus and took about two hours. Here’s a couple of items that we found indispensable when paddling in the Powell Forest. Before hitting the circuit, drop into Tourism Powell River to pick up a map. 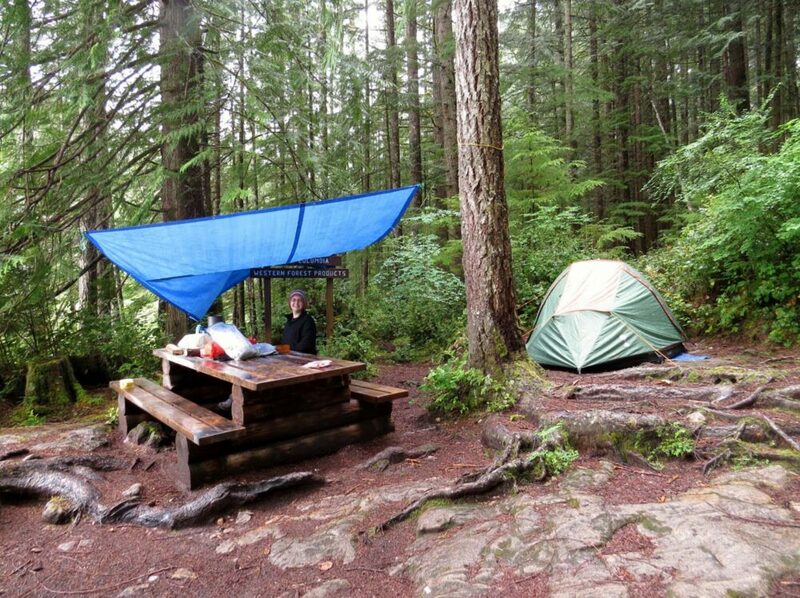 No matter the time of year, bring a lightweight tarp for shelter. To stoe our camera, we use a Pelican case – it hasn’t failed us yet despite plenty of torrential rain and some accidental dunkings. Cooking: Jetboil MiniMo for ultralight trips, Snow Peak Gigapower for trips with more cooking, Jetboil Genesis for base camping paddling trips with no portages. Sleeping: Klymit Insulated Static V for JR, Exped AirMat Lite for me, Exped Synmat HL Duo together. Sleeping bag wise – old 0c rated bags from MEC. Clothing: Merino wool tops and socks, usually Icebreaker brand. Trousers/shorts are Kuhl, Rab, Dish, Duer. 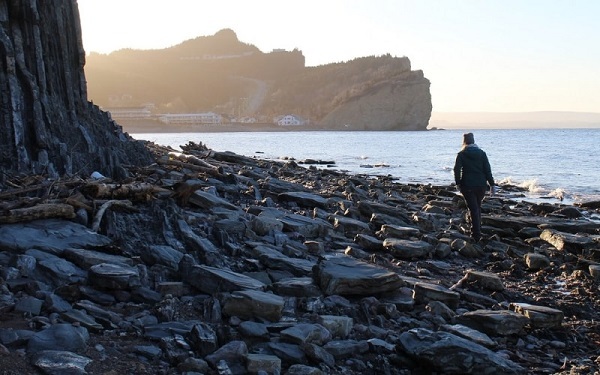 Rainjackets and down jackets are Arc’teryx and Patagonia. PIN or save this post for future reference with the above image! All of these BC posts have me brimming with pride at how beautiful the place I call home really is. However I’m also incredibly ashamed at how little of it I’ve seen. Thanks for continuing to open my eyes to BC! Hey Calli, my thoughts exactly! I may be fairly new to being a Canadian resident and all, but I’m pretty proud myself! It’s truly an amazing place to live. Hope you fit in some adventures of your own this summer. Loved the pictures – again.